Berkley “Peanuts” Taylor and his wife, Linda, enjoy the tributes. UB President Dr. Rodney Smith welcomes attendees. The daughter of Eric “King Eric” Gibson reminisces about her father. Craig Flowers, who gifted the statues to UB, greets the legendary “Peanuts” Taylor. Among the fitting tributes were Bahamian songs and dance. Colours Entertainment thrilled the crowd. 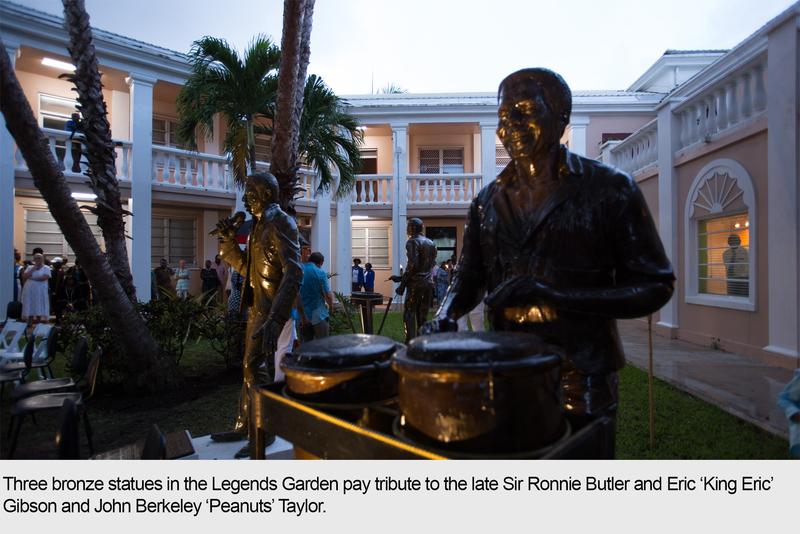 Just to the east of the Keva M. Bethel Building at University of The Bahamas’ (UB’s) Oakes Field Campus sits a Legends Garden that pays homage to three iconic Bahamian musicians whose unique storytelling has helped to shape the narrative of The Bahamas. Three bronze statues capture the essence of the late Sir Ronnie Butler and Eric ‘King Eric’ Gibson and John Berkeley ‘Peanuts’ Taylor. Taylor was among the persons who attended a splendid musical performance during which the statues were unveiled on Thursday, 19th July. 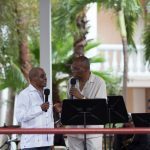 Also a Bahamian legend, Sir Charles Carter reflected on the lives of these great men and how they helped to establish the Bahamian music industry and advance The Bahamas’ brand on the world stage. Sir Charles referenced an old Bahamian tune performed by ‘Peanuts’ Taylor and the acclaim it brought The Bahamas. 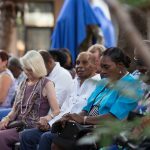 “In 1958 a miracle took place with music in The Bahamas. 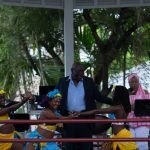 That was when a song called ‘Chi Chi Merengue’ was born…Oh yeah, that song put the Bahamas on the map,” he said while Taylor chuckled in response and beamed with pride. 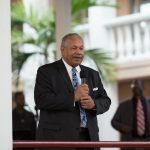 The only living legend of the three, Taylor told an audience of more than 200 what he loved about his music and the Bahamian entertainment scene. 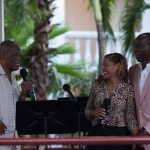 He credited his success and his love for entertainment to other talented Bahamians of his era. “What I liked best? I liked working with people like Eloise of Chi Chi Merengue. That was the first hit song that came out of The Bahamas and we were able to travel the world,” he said in a candid conversation with Sir Charles before an elated audience. 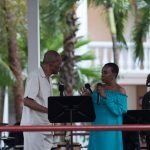 The ceremony, infused with Bahamian music of yesteryear, was also punctuated with brief conversations with the daughter of the late King Eric Gibson and the daughter of the late Sir Ronnie Butler who reminisced about what made each of their doting father’s musical geniuses. 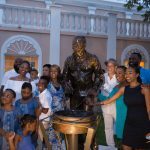 The Legends Garden, with its three bronze statues, is the infancy of a sculpture garden dedicated to celebrating Bahamian artists who achieve excellence locally and internationally. The area around the statues will be transformed as the space grows to accommodate arts and cultural activities on campus and for the entire community. While living in Martinique, entrepreneur Craig Flowers commissioned Nigerian sculptor Michael Maghiro to create the statues. Following discussions with the administration and the families of the entertainers, Mr. Flowers donated the statues to UB. 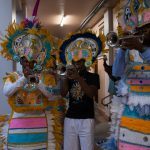 At the unveiling ceremony, a fantastic musical tribute included classic Bahamian songs, dance and Junkanoo. Son of “King Eric” Gibson, Mr. Shane Gibson also announced the impending establishment of an educational scholarship to UB, through a $5,000 annual gift from the Gibson family. UB Art Curator Antonius Roberts worked with Mr. Flowers’ organization to oversee the transport and installation of the statues on UB’s grounds. Additionally, Assistant Professor Chris Justilien, oversaw the compilation of a musical tribute to the three legends. With legends in its midst, UB will continue to cultivate a love of all things Bahamian – the culture, the music, the art, the people and harness the talents of its students to create the next generation of Sir Ronnie Butler, Berkley ‘Peanuts’ Taylor and Eric “King Eric” Gibson.